I had a recent realization about the story of Goldilocks and the 3 bears. You know how she goes into the house and sees the three bowls of oatmeal…. Papa bear’s oatmeal is too hot. Mama’s oatmeal is too cold, and baby bears oatmeal is juuuussst right! I never realized until now, as a parent, the truth of this situation. Papa has the hottest oatmeal because he is the head of the house he is respected by being served first. Baby has oatmeal that is just right because mom moderates the temperature so that he won’t burn himself. Lastly, Mama’s oatmeal is too cold because after she has taken care of Papa and Baby, she finally sits down to eat, after her food has lost all its heat. Such is the life of a mom! Haha! 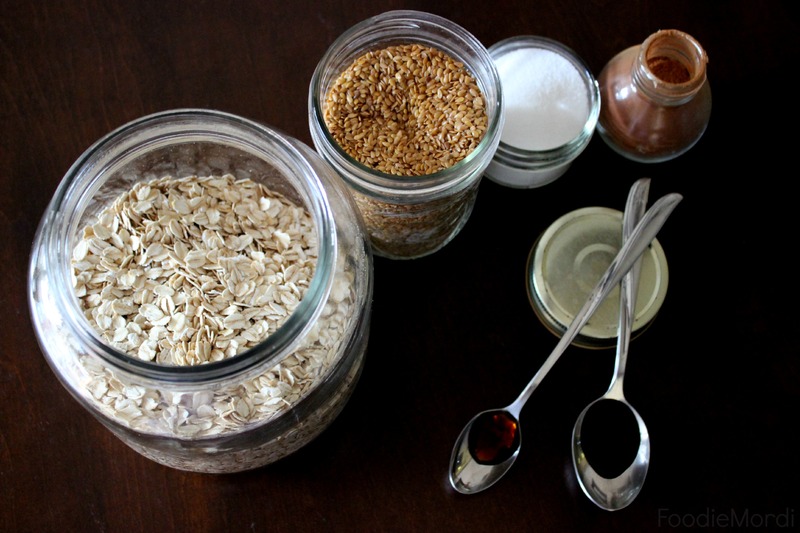 There are so many ways to make oatmeal! But let me just say, oatmeal tastes so different depending on how you cook it; using milk, instead of water, using the microwave instead of the stove (or the fridge). I love stove oatmeal and overnight oatmeal, but I also love microwave oatmeal! They are all delicious in their own ways. This post, of course, all about how we make our Microwave Oatmeal. I just wanted to do a quick re-cap, however, over other oatmeal recipes we like. Tropical Oatmeal and Cinnamon Apple Oatmeal are two great ideas for old fashioned stove top oatmeal. 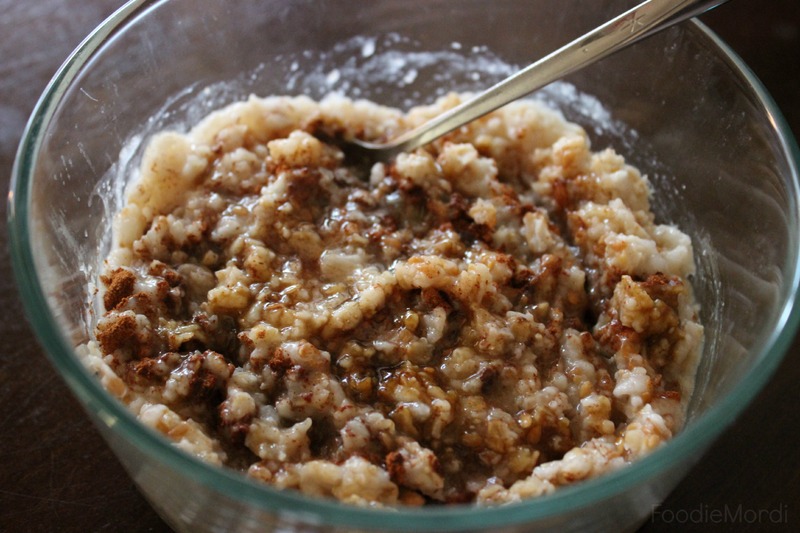 If you’ve never tried Steel Cut Oatmeal, then it’s time that you put it on your menu! Overnight oatmeal is also a great way to make up those oats, and this recipe for Banana Nut Overnight Oatmeal is our favorite version! I am sure you have all seen the microwave instructions on the oatmeal container in your cupboard. Maybe many of you have even tried making oatmeal this way. In this case, this post is for those of you who are like me, and make oatmeal the traditional way – on the stove. Along with the typical microwave instructions, I am also including the ingredients that we love to add to our oatmeal. We like different things in our microwave oatmeal than we do stove top or steel cut oatmeal. In our stove top oatmeal, we add milk, brown sugar and fresh fruit like strawberries and peaches. We put apples and almonds in our steel cut oats. In this microwave oatmeal we put Golden Flax Seeds, brown sugar, vanilla and cinnamon. It is just so warm and yummy! We have also put wild blueberries and raspberries (frozen mix) in it, which is incredible! Just a heads up – I use white sugar and molasses in my recipe, because I don’t buy brown sugar. If you prefer to use pre-made brown sugar, use 3 tsp of the sugar and omit the molasses. I will be giving you this recipe in single-serving portions, because that is how we make it. I have tried to triple the recipe (for the three members of my family), but you have to microwave it longer, and I don’t think it tastes quite as good. If you are going to be making oatmeal for many people, probably stick with the stove top version. But if you need a quick breakfast (3 minutes, literally) for yourself or your child, with few dishes and little time, this is your cup of tea… or oatmeal. Combine the oats, flax, salt and water in a microwave-safe dish. It will boil up, so use a bowl that holds 2 or more cups. Microwave the oatmeal for 21/2 minutes if the bowl is glass, or 3 minutes if it is plastic. Stir the oatmeal (microwave for 30 more seconds if there is still water resting in the bottom), then add the remaining ingredients. Mix and serve.